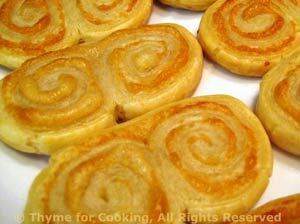 Palmiers, Puff Pastry Crisps with Parmesan, Thyme for Cooking easy biscuits. Easy to make and a great way to use up the leftover bits of puff pastry. You could also make them sweet: brush with melted butter and sprinkle with cinnamon and sugar; serve for dessert with coffee. Cut a rectangle of puff pastry. Lightly drizzle 1 - 2 tsp olive oil over the pastry. Sprinkle 2 tbs of Parmesan evenly over the top. Make a mental note (or mark it) of where the middle of the pastry is. 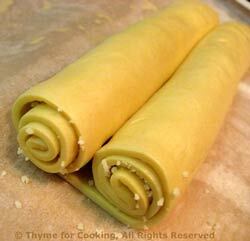 Starting at the short ends, roll the puff pastry to the middle until the two rolls meet. Wrap in cling film and refrigerate until used. It's easiest to slice if chilled for an hour and can be made 2 days ahead. Remove from fridge and slice 1/4" thick (.6cm). Lay on nonstick baking sheet and bake, 400F (200C) for 8 - 12 minutes, until pastry is golden and cheese is a bit darker. Remove and serve immediately or allow to cool and store in airtight container.